Worried about your financial future? Lord Ganesha has some tips for you. It is that time of the year when Lord Ganesha comes to bless our homes with peace, happiness and prosperity. Here are few things we can learn from the lord who himself symbolises wealth creation and financial wellness. The good Lord Ganesha is also called the vighnaharta or the remover of all troubles and is generally invoked before one begins a new venture. So, if you have been having troubles keeping your finances in order and worry relentlessly about your future, this is a great time of the year to begin financial planning with the blessing of the Lord. Gajanana or the elephant headed Lord himself sees and also encourages you to see the big picture. Worried about how your future will turn out as far as finances are concerned? Chalk out a financial plan. Begin with identifying your short, medium term and long term financial goals. The second step is to make a budget and see what your expenses are and how much you can save after having met them. With your investible corpus, identify the asset classes according to your risk appetite and invest in diverse asset classes to see your savings grow. The big picture should also include things like insurance allocation, retirement planning and estate planning. Lord Ganesha has small and sharp eyes and he is also called the Chinteshwara. The eyes of Ganesha symbolise focus and concentration. Once you have chalked out your financial goals, you should keep your eyes firmly on them and work diligently towards achieving them in the time frame you have stipulated for yourself. The Lambakarna or the large ears of Ganesha tell you to keep your ears open wide for financial advice. Today there is a lot of financial advice being disseminated on television, newspapers, websites and even social media platforms. If you are alert and keep your ears open, you will be able to glean the best advice that will help you remove the clutter from your portfolio and take the right investment decision that will help you create long term wealth. The Gajavaktra or the small mouth of the Ganesha tells you that you should not be loud mouthed about your finances or your financial plan. If you seek advice or need to discuss investment ideas do it only with a trustworthy few. The tusk of the Lord for which he is referred to as Ekdanataya conveys that one should have the ability to fork out the investments that are not performing well and holding back the potential of your portfolio. Periodic assessment of your portfolio is an important part of financial planning. If you keep a hawk eye over your portfolio, you will be able to identify those investments that need to be sold off to book timely profits and invested elsewhere for better returns. 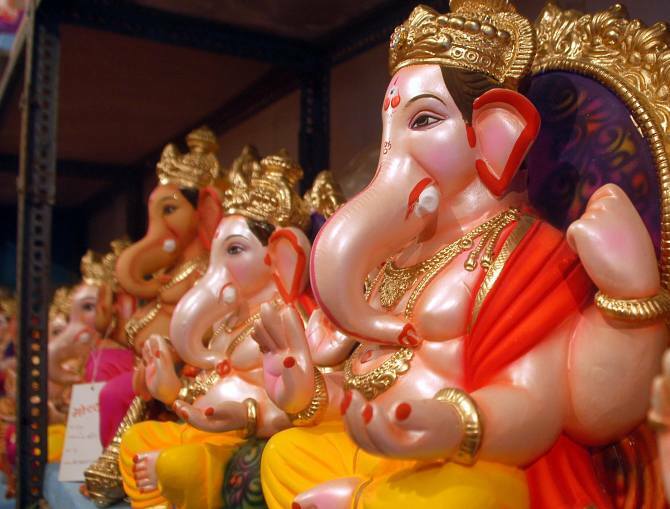 Lord Ganesha is referred to as the Vakratunda or the one with a large trunk. The trunk of the Lord tells you to be patient and adaptable when the things are not so good. Market conditions vary due to several macroeconomic factors and that at times may have a negative impact on your portfolio. At such times, you should not panic and make rash decisions. Instead, you should keep your cool and see what best can be done as far as rejigging your portfolio is concerned. The large stomach of the Lord, by which Ganesha is referred to as Lambodara tells you that you should have the ability to stomach the good as well as bad. Despite taking precautions, it is imperative that you will incur some losses from time to time. The large stomach of the Lord says that you should have the adequate risk appetite to stomach the consequences of your investment decisions. Modaks, the favourite dessert of the Lord is distributed as prasada after the aarti is done. This is the Lord's way of telling you that if you have worked hard to make a financial plan successful you will be rewarded with sweet gains in due course of time, and can lead a life sans financial worries. So now that you have learnt what the beautiful deity symbolises, do invoke His blessings as you embark on the path of wealth creation. The author is a credit expert with 10 years of experience in personal finance and consumer banking industry and another 7 years in credit bureau sector. Rajiv was instrumental in setting up India's first credit bureau, Credit Information Bureau (India) Limited (CIBIL). He has also worked with Citibank, Canara Bank, HDFC Bank, IDBI Bank and Experian in various capacities. By Lord, Gurmeet to star in Geet!